You think you know your Fire 7? Think again. Tablets are designed to be user friendly, but we tend to use only some of their features because no one told us others exist! This is a quick and easy guide which answers all your questions. No advanced computer knowledge is necessary. 15 minutes is all you need to set up your Fire 7 and use it to the fullest! 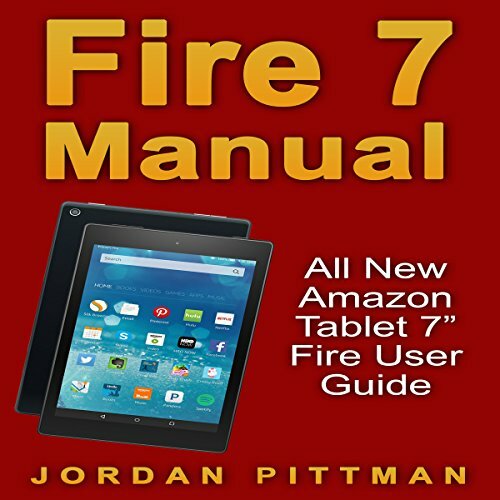 Fire 7 has been hugely popular despite being a "mini" version of the Kindle Fire HD. It boasts an impressive set of features like the 1024x600 display, a quadcore 1.3Ghz processor, 1 GB RAM, and a whopping 8 GB of internal storage. Learn directly from an experienced and expert writer on a whole range of Amazon devices like Echo, Fire HD, and Tap. A good picked of Fire 7 manual. This audiobook answered all my questions n how to use Amazon Tablet. Satisfied costumer here, great to have it if you never tried to use it before. Useful companion for the newbie on kindle fire. Where does Fire 7 Manual rank among all the audiobooks you’ve listened to so far? This book is great for all the questions we have among the other books. This audio piece has convinced me that the said tablet is worth buying. In less than an hour, the narrator has tackled setting it up and highlighting its best features. Won't consider other resources anymore. Just this. Why Amazon wouldn't ship a user's manual with the Fire is behind me! Are we supposed to try &quot;trial-and-error&quot;? Good manual, and it's not that expensive. I purchased this book to get the most out of my audible. The author is great and explained very well. The book is authorised for me and has given me a powerful tool.highly recommended. I love this book. It turns you master within 30 minutes and its the best potential user guide. I suggest this to my all friends and family. each user must hear this book and then use the device. I will keep this short, simple, and to the point: if you are even considering buying the new tablet from Amazon, you must get this book. With directions and tips that are concise, simple, and written in plain English instead of techo-babble that only a genius would understand, you need this book. If you bought a Fire 7", this is the book that provides you the info required to make the most of your tablet. An honest talk with no tech words that can't be explained. Easy to understand for those of us who are not techies. What I love about 's user guides is their plain speech. You don't have to be a techno-geek to hear and get useful information from this Audiobook.